Every year around this time my mom makes a huge batch (or several huge batches) of her famous Christmas candy. It is so well known among our family and friends that people will pester her for a bag of their own. Our good family friend even asked my mom to make this candy for her wedding as part of her out-of-town bags. While in town for the holidays, my mom mentioned that she was going to make another batch. I told her to wait while I was around so that I could take pictures and share the recipe on the blog. She kindly obliged. It's actually a recipe I have been wanting to put on the blog for a while, but I never seem to make it for myself. Which is a shame, because the recipe is so easy! 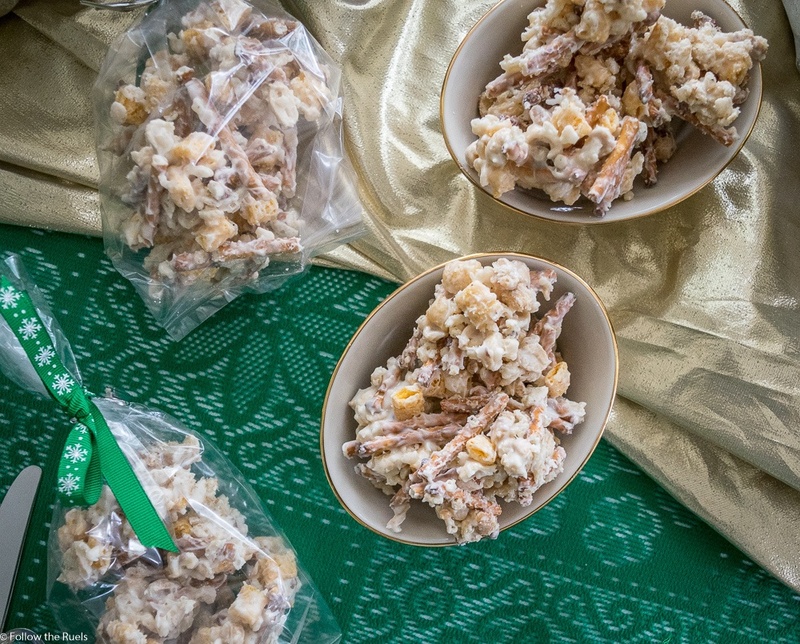 It only calls for 2 cups of each: Rice Krispies Cereal Captain Crunch Cereal Peanuts Then you add half a bag of pretzel rods and pour oven some melted white chocolate. After a good stir, I just drop spoonfuls of the mixture onto some parchment and let them dry. The whole process takes less than 30 minutes. There is no baking required. But the result is a sweet, crunchy, slightly salty treat! It's the perfect last minute Christmas candy! 2 oz 12 bags white chocolate chips, melted. In a large bowl, mix together the cereals, peanuts, and pretzels. Pour the melted white chocolate over top and stir to coat. Using two large spoons, drop spoonfuls of the mixture onto parchment paper or wax paper. If the mixture starts to harden, place in the microwave for 30 seconds at a time, until the chocolate has remelted. Let the candy sit on the parchment for 10-15 minutes, until completely cool and hardened. Store in air tight containers or bags and hand out to friends!